The Skagen Falster, one of the prettiest Android Wear smartwatches, is now available for purchase over at Skagen's official website, with a price of $275. The Falster is Skagen's first true smartwatch. The company makes a few hybrid watches that look and feel like analog timepieces, but have a dial that gives you a quick peek at your progress towards a daily step goal. The new Falster is completely different, a truly digital timepiece that comes with a round design and runs on Android Wear 2.0 and supports the helpful Google Assistant. And yes, of course, you can get additional apps for it via Google Play. The case is 42mm in size, with a unisex styling, but a size that leans slightly more towards men. The case is 12mm thick, just slightly thicker than your average watch and the watch itself is 1ATM/IP67 rater water-proof, so it will survive a short dive in water, but you probably should not swim with it. You also have two versions: one with a stainless steel mesh and one with a leather band, and the bands are easily interchangeable. The battery life on the Falster is up to 24 hours on a single charge, so this will be one more gadget that you have to charge every night. It comes with a handy magnetic charging dock in the box. 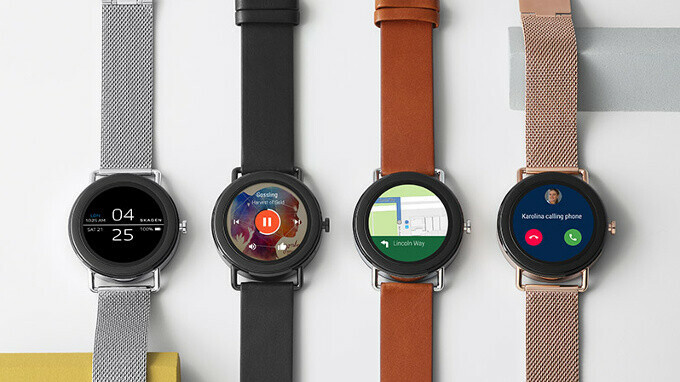 Android wear: Slow to almost non existent updates Mediocre towards bad app support and apps features Terrible battery life I wouldn't touch an android smartwatch until google and its buddies start taking it seriously. The apple watch OS had more updates in one year than the android wear in 3.
and if you are in a android ecosystem, what has to do with apple watch, since is not working with android! There are ftequent update done thru the android wear app in play store. Eg, like the reccent dark UI my watch manage to get after updating the android wear app. The product images vary on how big the bezels are. In the one image where the woman is tying her hair back, the display looks huge with minimal bezels, but in the last image there's another black bezel already around a fairly thick bezel. I'd consider the watch if it had the minimum bezels like the one image shows but clearly the finished product isn't like that. 1ATM is not the same as IP67, if it's 1ATM water resistance it can survive where the water pressure differential is less than one atmosphere pressure which is 14 pounds per square inch ( 100 kPa ) which is about 33 feet. IP67 means Ingress Protection (rating). It was a rating created by the IEC to classify degrees of protection for enclosed electrical devices. The first number in the rating provides the degree of protection of solid foreign objects like sand and dust. The second number provides the level of protection against moisture.